Initially Partenavia P68B ZK-LAL (c/n 70) was used with the company’s other twin-engined aircraft being used for backup. 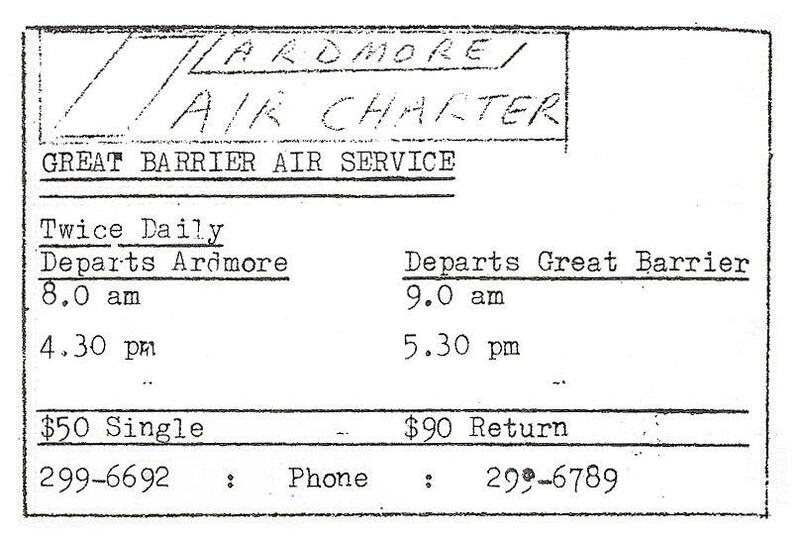 Ardmore Air Services Partenavia P68B, ZK-LAL, taken at Ardmore. 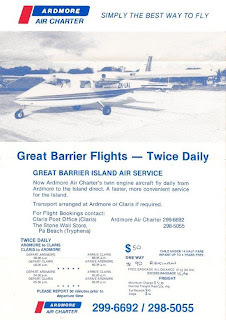 From December 1984, in an attempt to keep fares down in the face of increasing fuel prices, the company, while preferring to use twin-engined aircraft, also used single-engined aircraft on the route. At this stage it as also announced that all flights would operate on a demand basis with a minimum of two confirmed full fares required. One of many single engined aircraft Ardmore Air Charter operated, Cessna 172 ZK-EJQ at Ardmore on 23 May 1988. Despite the service initially looking to be quite promising the business did not grow. 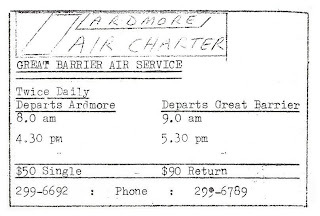 The service was last advertised in the Barrier Bulletin in the June July issue of 1985 and in the Southern Cross Airways timetable of 28 October 1985. 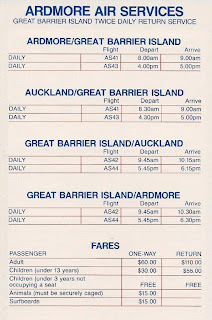 The service presumably ended at the same time as the Southern Cross Airways service in either late 1985 or early 1986. 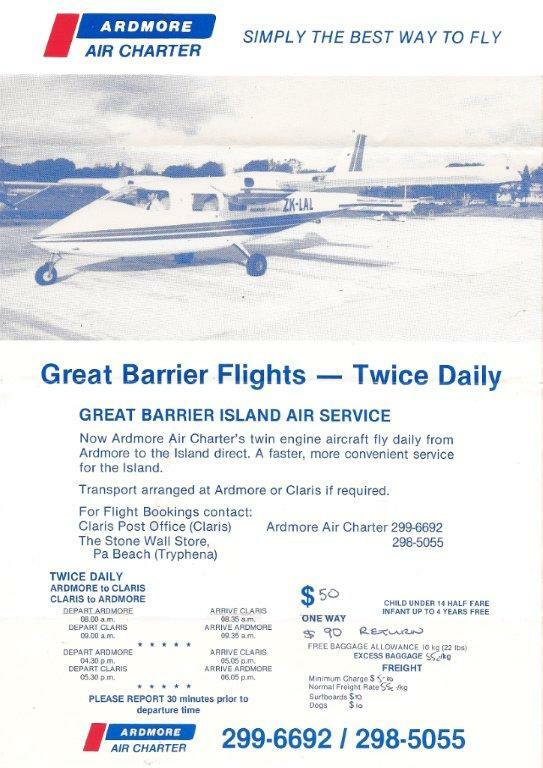 The last advert in the Barrier Bulletin, while it was still being produced on a Gestetner machine, in June-July 1985. 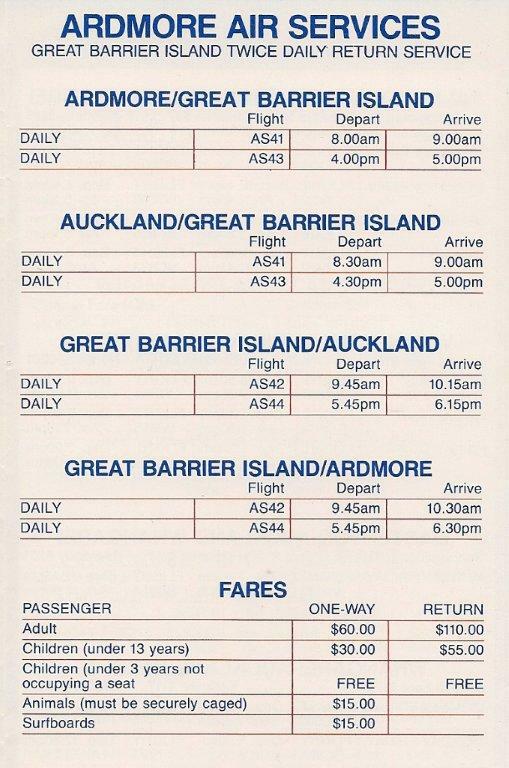 The last advertising of the service, in the Southern Cross Airways timetable of 28 October 1985. Way to Go Golden Bay Air!